The Sartell High School Gymnastics Team placed second at state on Feb. 22. 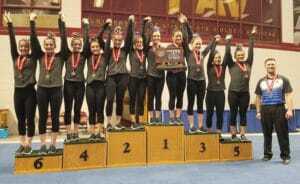 This is the highest the team has placed at state. The team scored a 148.225 to secure their standing. (From left to rightO Morgan Weber, Christa Meyer, Emma Schwartz, Carly Yang, Grace Wittmer-George, Ali Boschee, Abby Weber, Jes Lemke, Marley Michaud, Ella Simmons, Brenna Chisholm and Head Coach Tyler LaBonne.